Sea urchins have been devouring kelp forests in B.C. — an important part of the local ecosystem. But one expert is optimistic these areas will be able to flourish again with the help of projects like an urchin culling program happening in Haida Gwaii. A project to smash sea urchins is underway in B.C. in an effort to restore Haida Gwaii's disappearing kelp forest. The effort, which began in September, aims to remove 75 per cent of the sea urchins along three kilometres of the coastline of Murchison Island. The quality urchins will be harvested to feed communities in Haida Gwaii, while the rest will break down underwater and contribute to food sources for sea life. The hope is that will give the kelp a chance to regrow. "Kelp is just a very important part of our ecosystem," said Lynn Lee, a marine ecologist with Gwaii Haanas National Park Reserve, whose research sparked the urchin culling project. "It forms [the] habitat for many of the species that we depend on, and also many species that are part of the ecosystem," she told The Current's Anna Maria Tremonti. However, warming waters and the disappearance of predators, like sea otters, have given the sea urchin free rein to munch away at the kelp. What remains is an urchin barren — an area where sea urchins have removed all the kelp — "the equivalent of a clear cut on land," according to Lee. Thousands of sea urchins will be removed in the ongoing project, but officials aren't certain what the final number will be. 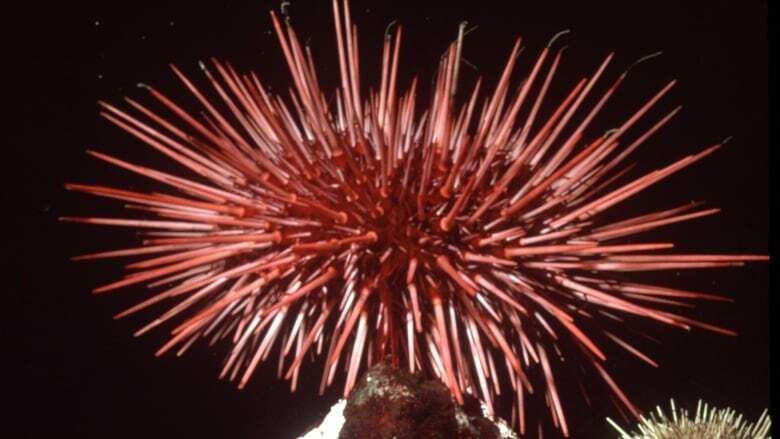 Urchin control and monitoring will continue for three years. Daniel McNeill, a shellfish biologist and diver with the Haida Fisheries Program, is a part of the team clearing the urchins from the seabed. "I prefer using a rake and a hammer, because the rake basically gives you an extra foot of extension," he told The Current. "I usually use a rake to grab the urchin and then I use a hammer to bust the shell open," he said. "Basically you go down and you start popping holes into the shells." Biologist Matt Edwards is supportive of projects like the urchin culling project in Haida Gwaii, which engage the local community. However, it's labour intensive work over a big span of coastline — some of which may not be accessible because of large waves and the geography of the coastline, he said. "For local areas, I think it is possible to control the urchin populations and return some of the kelp forest," the San Diego State University biology professor told Tremonti. "But over the big scale … allowing those big predators that really are much more efficient than us — again, they forage 24 hours a day, 365 days a year and over large areas — I think ... returning those big predators is really going to be a big step in this." Although the problem of disappearing kelp forests is happening in spots all along the western coastline of North America, Edwards remains optimistic they will flourish again in some places, like B.C. "The time scale might be, you know, a little longer than some of us like. It might be in the years. But I think ... the kelp forests will eventually rebound,"
Written by Kirsten Fenn. Produced by Jessica Linzey.